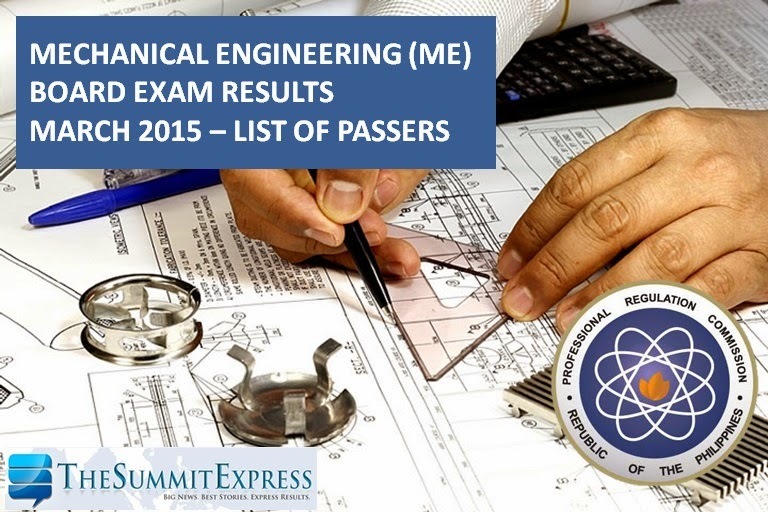 Those awaiting results of March 2015 Mechanical Engineer (ME) board exam and Certified Plant Mechanic (CPM) licensure exam may find here the full list of passers, top 10 (topnotchers), top performing schools and performance of schools as the Professional Regulation Commission (PRC) and the Board of Mechanical Engineering released results on Wednesday, March 11, 2015. PRC named a total of 739 out of 1,247 who have passed the Mechanical Engineer Licensure Examination and 19 out of 28 passed the Certified Plant Mechanic Licensure Examination. The Board of Mechanical Engineering (BME) headed by Engr. Leandro A. Conti, Chairman and Engr. Vicente B. Vosotros, Member gave the examinations on March 7-8, 2015 in the cities of Manila and Cebu. Registration for the issuance of Professional Identification Card (ID) and Certificate of Registration will start on March 18, 2015 but not later than March 20, 2015. Those who will register are required to bring the following: duly accomplished Oath Form or Panunumpa ng Propesyonal, current Community Tax Certificate (cedula), 1 piece passport size picture (colored with white background and complete nametag), 2 sets of metered documentary stamps and 1 short brown envelope with name and profession and to pay the Initial Registration Fee of P600 and Annual Registration Fee of P450 for 2015-2018 for MECHANICAL ENGINEER; Initial Registration Fee of P450 and Annual Registration Fee of P420 for 2015-2018 for CERTIFIED PLANT MECHANIC. Successful examinees should personally register and sign in the Roster of Registered Professionals. ME board exams include the following subjects: power and industrial plant engineering on the first day and mathematics, engineering economics, basic engineering sciences, machine design, materials and shop practice on the second day of tests. Meanwhile, CPM board exam covered subjects such as elements of power plant machinery and shop machinery and practice and elements of industrial plant machinery. In October 2014 exams, results were also released in two (2) working days after the last day of exam. PRC named a total of 2,960 out of 3,841 who have passed the Mechanical Engineer Licensure Examination and 32 out of 59 for the Certified Plant Mechanic Licensure Examination. Batangas State University (BatSU), Saint Louis University, Technological University of the Philippines (TUP) - Visayas and Southern Luzon State University (SLSU) - Lucban are among the top performing schools. Like Us on Facebook, Follow Us on Twitter or Subscribe to our E-Mail list via Feedburner to receive more updates.